In the How much protein do you need to optimise satiety article we looked at the critical role of protein in managing hunger. The analysis of half a million days of MyFitnessPal data showed that your body is satisfied with less energy when you give it adequate protein. So, with protein locked in, this article looks at how fat, carbohydrates and fibre affect our appetite. The chart below shows the scatter plot of fat versus % goal calories consumed for about half a million days of food logs from 9,900 MyFitnessPal users. On the vertical axis, an intake of less than 100% line means that an individual logged less than their goal for the day. A typical goal calorie intake is set at about 15% below a person’s Basal Metabolic Rate or the amount of energy needed to maintain weight. To make sense of all this data, we divided it up into 25 “bins’. Each of the dots in the middle of the chart below represents the average of 22,000 days of data, while the ones at the extremes where there is less data available represent around 11,000 days of data. This analysis suggests that the lowest spontaneous energy intake occurs with a lower fat intake. 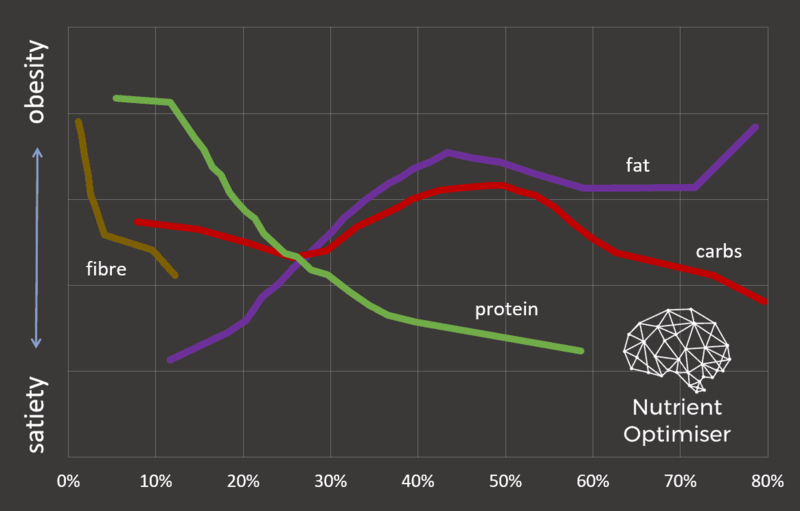 Satiety seems to improve a little when we have around 60 to 70% fat, presumably because we can still accommodate a reasonable amount of protein. Satiety is the worst at the highest levels of fat, likely because refined fat is energy dense and there is no room for protein. Many people report that they find fat satiating. However, this is likely because they are able to consume a lot of calories quickly, so they feel full. However, on a calorie for calorie basis, the data indicates that fat is the least satiating macronutrient. While you feel full sooner, you had to consume more energy to achieve satiety. The chart below shows the scatter plot for carbohydrate vs % goal intake achieved. The simplified chart for carbs is shown below. We get the lowest satiety when carbohydrates make up about 47% of the energy in our diet. We see some improvement in satiety with around 25% carbs. A very low carbohydrate intake provides less satiety, presumably because it corresponds with a higher fat intake. Satiety improves dramatically when carbohydrates exceed 60%. Dietary battle lines tend to be drawn around extremes of low or high carbohydrate (e.g. low carb and keto vs plant-based, vegan and fruitarians). This data suggests that both camps may be correct to some extent. We just need to avoid the middle ground of moderate levels of carbohydrate combined with moderate fat levels of fat, particularly with low protein (a.k.a. hyper-palatable junk food). On the high carb extreme, it’s going to be hard to ingest enough energy to overeat. But when we add generous amounts of fat, we are able to consume enough energy to exceed our daily requirement. Then due to oxidative priority, carbohydrates must be burned off first. So any excess fat that is not burned at the end. So it seems we can do OK with either extreme of high or low carb. It’s the ‘grey zone’ of moderate fat with moderate carbs that seems to really mess us up. There are plenty of examples of people who seem to do well on either high or low carb extremes in nature. However, we very rarely find a combination of both fat and carbs together with low protein. The closest we come to this in nature is milk, which is ironically a pretty good growth formula! Food scientists spend a lot of time trying to optimise for this bliss point of the optimum mix of fat, carbs and salt that will enable us to eat more of their food. If you want to avoid obesity, diabetes and the most common western diseases your mission is to avoid this grey zone. The chart below shows the plots for protein, fat, carbs, sugar and fibre together. Decreasing fat is likely to help you eat less. Unprocessed contain more fibre are beneficial. Varying carbohydrates has a smaller impact on satiety compared to manipulating fat or protein. So, to understand how to apply this, let’s look at some examples of each of the foods that fit these categories. Once you push protein above 50% there isn’t much room for fat or carbohydrates. You will struggle to over-consume these foods! These foods have low protein and a mix of carbs and fat. On the low carb end, we get improved satiety when carbs are below 30%, protein is greater than 20% and we have less than 60% fat. This is the sort of macronutrient profile that we would have experienced before agriculture away from the equator and/or during winter. These foods are not as satiating as the ultra-high protein foods, but they will be a vast improvement on low protein junk food diet. We also seem to get improved satiety when carbs go above 60% with more than 20% protein. Most people who lived close to the equator (or in other places during summer) would have had access to higher carb foods that contain less fat. These foods have a lower energy density and hence are very hard to overeat! If you are going to use a high carb low fat approach you may need to go out of your way to ensure you get adequate protein, particularly as proteins from plant-based sources tend to be less bioavailable. We seem to get improved satiety with either lower carbohydrates (between 20 and 30%) or high (greater than 60%) carbohydrate. Lowering fat reduces energy density and helps us reduce our overall energy intake. avoid foods that are high in both carbs and fat and have minimal protein (aka junk food). Alternatively, if you want to ignore macronutrients altogether, you can focus on nutrient density using the Nutrient Optimiser and get pretty much the same outcome. I see what the data says but calories does not necessarily equal satiety, it just means they are eating less calories and could be going hungry. Some of the foods are coming up twice in the same list, with different numbers. Like turkey in High satiety, low carb. I believe you meant to say “If your goal is to spontaneously reduce calorie intake and lose weight WITH minimal hunger you should consider:”. Great article otherwise. In my most recent experience losing weight, I had been on a 1200 calorie diet for 4 months (I’m 6’2″, weighed 270 at the start of the diet and am 50 years old). A high fiber diet (>20 grams a day) in combination with high protein, moderate carbs and low fat worked to satisfy my hunger. There were some days I ate less than 1200. Lost 65 pounds in 6 months, but I also walked 7000 steps per day, 5 days a week. Also, you should provide examples of meals. Make it applicable to the everyday person. Many do not know what “satiety” is. This is very a very interesting analysis. I’m I correct to assume that either option (Low Carbs or High Carbs) will be able to assist achieve optimum blood glucose levels (~4.6 mmol/L)? And that with the High Carbs option, it’s primarily nutrient dense vegetables and little fruit? So do you know that because you hacked all those accounts?? Nice article thanks. In the table with % of carbs, where did you get the ingormation for lettuce that it contains 63% of carbs? 100grams of lettuce has 63grqms of carbs? the one thing not on the graphs is weight loss or gain. Do people who eat moderate fat and carbs gain weight? Who loses weight on low carb or high carb, is it men or women? Is there fast weight loss with one? since this is Optimising Nutrition, which ratio will give us a full nutrient intake on fewest calories? I have gone from struggling with increasingly high fasting blood sugar on the keto diet, as well as almost impossible to keep to long term. I struggled with it for 10 years because everyone said that carbs are the enemy of fat people! So boring. Now I’ve lost 10lb in 4 weeks on a Whole Food Plant Based, no added fats ,NO food logging! What a relief :-). I wonder if someone finds a diet that actually works do they all stop logging food? If so MFP will be skewed to diets that fail. The graphs show calories and % goal intake. We don’t have data for weight gain or loss. Max nutrients with min calories is the overall goal of all this! This post sort of explains why high carb low fat works. It’s the combination of fat and carb with low protein that gets us into trouble. The goal is to identify things we should and shouldn’t do for satiety so we don’t have to track. Thanks Cian. Your stuff is really insightful!!! I’m surprised it hasn’t been recognized by more people yet!